The Master of Philosophy is a programme of independent, supervised research and is assessed solely on the basis of a thesis. This program can be taken in any discipline especially in the area of informatics, for which appropriate supervision is available. This program will be conducted at Advanced Informatics School (UTM AIS), Universiti Teknologi Malaysia, Kuala Lumpur. Master of Philosophy graduates move into a wide range of careers, depending on their areas of research, from the more traditional pathway of research and academic careers to various professional arenas in a wide variety of informatics fields. Exploring the knowledge and theories suitable for the particular master level research context. Identifying and analysing the appropriate level of research problem and producing suitable research proposal. Justifying and verifying the proposed research using related fundamental theories. Performing the research in a systematic manner. Presenting and defending their research. Writing and publishing their research work. This Master research program is fully research-based. 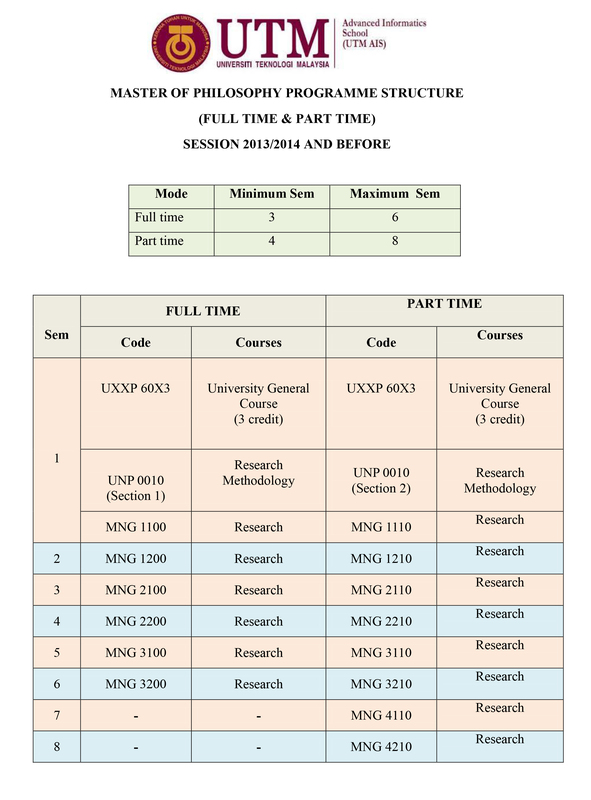 However, students are also required to take one university general elective course and a research methodology course. For Master programme, assessments are carried out using progress report at the end of every semester. Students are also required to present their research progress through seminar and colloquiums organized by the School. The student will be expected to present his/her proposal by the middle of the second semester. This course introduces students to the fundamentals of research methodology which include a general introduction to postgraduate research, its methodologies and organisation. It is designed to support postgraduate students in developing their research proposal and to guide students through a range of issues and considerations which should inform their general approach to research. Students will learn a range of research tools, and will be equipped to plan and organize their research, as well as to communicate their findings. This course is designed for international Master and Doctor of Philosophy students from countries of Malay origins such as Indonesia, Brunei, Singapore and South Thailand. Students will be exposed to scientific paper writing. In this course, students are given an overview of scientific writing. They are also taught about the scientific paper writing method, particularly academic writing style. Furthermore, students are also taught about writing formats such as collections, bibliographies and editing to fit the format described academic writing UTM. Bachelor degree with honors (CGPA > 3.00) in Computer Science, Information Technology or a related discipline from Universiti Teknologi Malaysia or any other institutions of higher learning recognized by the UTM Senate; or for those without a good honors degree, candidates must have substantial working experience in the area. Upon being accepted into the program, all international candidates are required to produce their English Qualification in the form of IELTS (min 6.0) or TOEFL (min 550). All international students applying to UTM must have a valid two-year old TOEFL or IELTS certificate. For exempted from the UTM English language requirement, click here.